Like lots of other curious and romantic minds throughout history, when I was younger I was enthralled by Greek mythology. How easy it was to get lost in the world of those larger than life mystical creatures, humans, and deities. My copy of D’Aulaires’ Book of Greek Myths was beloved. I tore through its pages almost nonstop throughout my childhood and teenage years, gulping down tales of nymphs and centaurs and wishing someone would hurry and invent time travel so I could see for myself what life was like in ancient Greece. In the 6th grade I sewed my own Aphrodite dress for Halloween, so determined was I to do everything I could to channel the glory of that luscious Olympian time. Besides D’Aulaires, there was Xanadu and Xena Warrior Princess to quench my thirst for this mythical world – and the endless reaches of an extremely hyper, immensely overactive imagination. It was this imagination that had me convinced that when my friend and I would pick fresh pomegranates from her yard and eat them in her tree house, daintily avoiding any blood-red spatters on our clothes (but relishing the way the juice stained our fingers crimson), that some small bit of ancient Greece was still alive. The pomegranate, as any mythology aficionados among you will surely recollect, was the fruit of choice with which Hades tempted Persephone, his stolen bride, after dragging her into the underworld. She could no more resist those tangy sweet seeds than I, many thousands of years later. She paid dearly for eating just a few – she could only return home above ground for part of the year; the rest of the time she was forced to live with Hades as queen of the underworld. Luckily, pomegranates run a much cheaper price these days than half a year in hell. I would like to think that by including them in a recipe for pie, I have done some small honor to the goddesses and gods by improving upon their second favorite snack (right after ambrosia). It’s the very least a mythology-geek and a mere mortal can do to pay tribute to the fantastical stories and the endless hours of daydreams that they — the fierce goddesses, the improbable beasts, and the dashing gods — have given me. On a well-floured surface, roll out half your pastry crust. Using a wide-mouthed glass, cut out 10 circles. Roll out each of the circles a little more, then press each one into your muffin tin, lining the bottom and sides and leaving about a 3/4 inch overhang. Place dough-lined tin in fridge to chill. 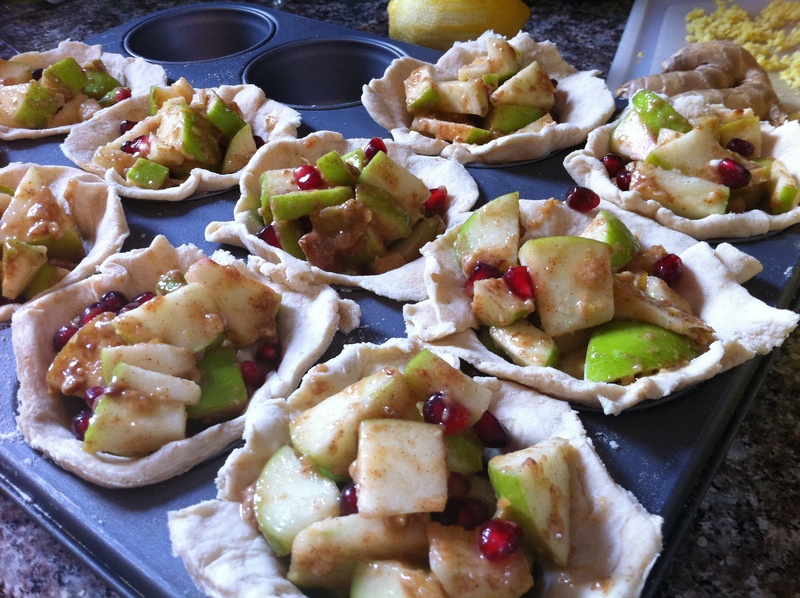 Mix apples, lemon zest and juice, pomegranate seeds, ginger, spices, flour, and sugar in a large bowl. Mix well so the apples become evenly coated and there is no dry flour or sugar left. Set aside. Roll out the other half of your pastry crust, and use a knife to cut strips about 1 1/4 inch thick. Then cut the strips again so they’re about 3 inches long. 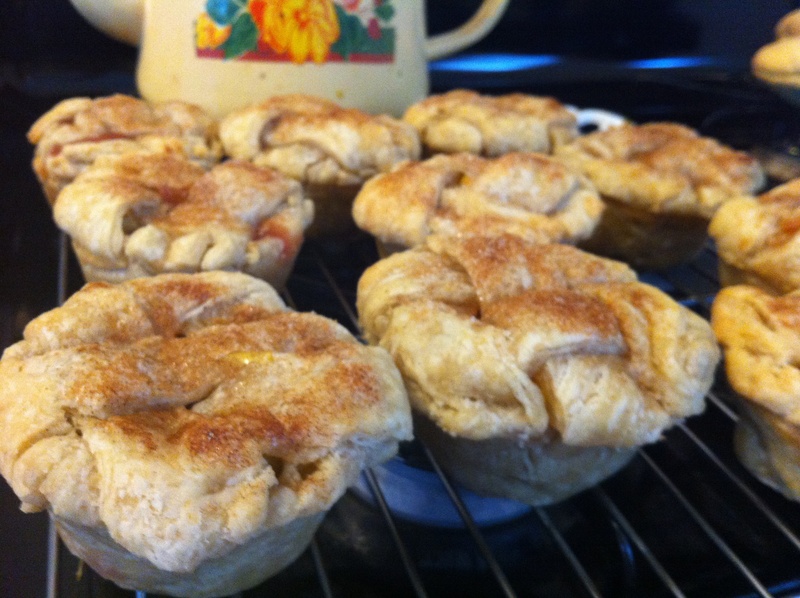 Remove your dough-lined muffin tin and spoon the mixture into your waiting mini pie shells. Let the fruit pile up about a half an inch above the top of the pan. 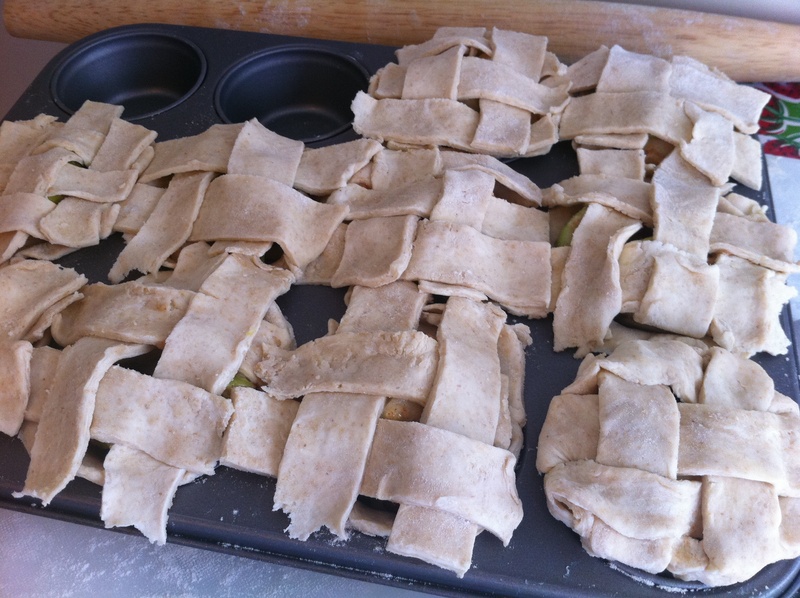 Create the lattice top by criss-crossing your 3-inch dough strips. Place them close together to avoid too much moisture seeping out during baking. Trim the excess dough around the mini pies so you have just enough to pinch the edges tightly together. Brush the pies with milk and sprinkle with the cinnamon-sugar mixture. Place in the oven on the middle rack and bake for 30-40 minutes, rotating once in the middle. When crust is deep golden, remove and let cool before serving. 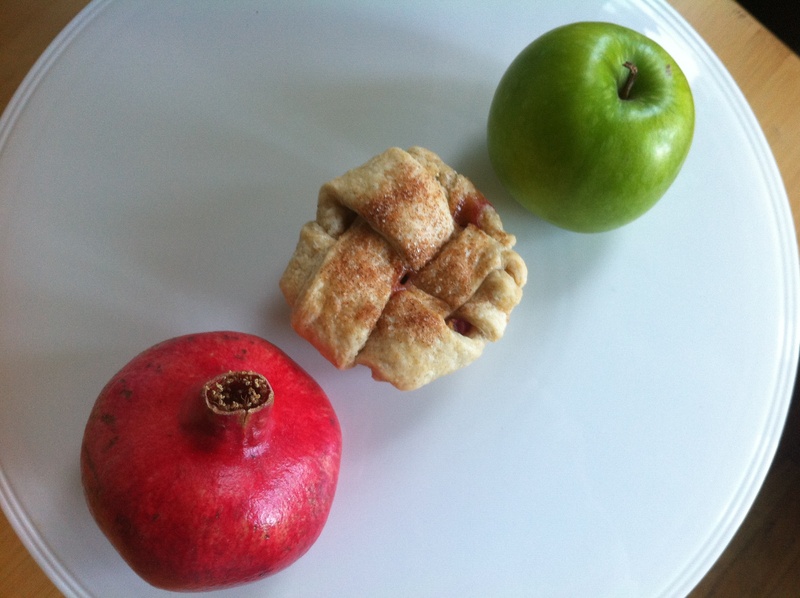 This entry was posted in Pie, Vegan and tagged apple, ginger, mini pie, pie, pomegranate. Bookmark the permalink.